File - An Ebola trials notebook is seen in a laboratory during trials for an Ebola vaccine at The Jenner Institute in Oxford, southern England January 2015. Researchers said an experimental Ebola vaccine has shown to be "highly effective" at preventing the deadly disease. The World Health Organization said Friday that the vaccine has so far been 100 percent effective in trials conducted in Guinea. The British medical journal Lancet has published preliminary results and analyses. The new vaccine "may be the silver bullet against Ebola," said Børge Brende, the foreign minister of Norway, one of several countries involved in the trials. 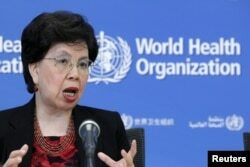 World Health Organization (WHO) Director-General Margaret Chan addresses the media on WHO's health emergency preparedness and response capacities in Geneva, Switzerland, July 31, 2015. The Ebola outbreak that swept through West Africa last year has killed more than 11,000 people, most of them in Liberia, Guinea and Sierra Leone. Ebola is one of a number of highly dangerous viruses known as hemorrhagic fevers. There are hopes the new vaccine may be a breakthrough in combating all such diseases. The blood of a survivor of the Ebola virus is extracted as part of a study launched at Liberia's John F. Kennedy Hospital in Monrovia, Liberia, June 17, 2015. The vaccine, known as VSV-EBOV, was tested beginning in March on more than 4,000 people in Guinea who had come into close contact with the Ebola virus. Initial results were so promising that random trials were stopped this week so everyone at risk could receive the vaccine immediately, WHO said. “These are the first results. ... They need to be further looked into and we need to still collect more data on the vaccine, " noted John-Arne Røttingen, director of the Division of Infectious Disease Control at the Norwegian Institute of Public Health, which conducted clinical trials of the vaccine in Guinea. Margaret Chan, WHO's general director, told reporters in Geneva that scientists, doctors, donors and drug companies collaborated in development of the vaccine. "If proven effective, this is going to be a game changer, and it will change the management of the current Ebola outbreak and future outbreaks," Chan said at a news conference. Because of the shifting nature of the epidemic and a sharp drop in the number of new Ebola cases in Africa in the past few months, researchers switched their tactics as they began the drug trial. 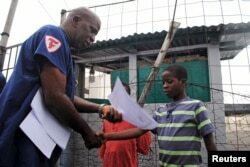 Moses Duo, 9, receives a certificate for being cured of the Ebola virus in Paynesville, Liberia, July 20, 2015. What had been a generalized outbreak expanding extremely rapidly last year switched to a series of sudden, small outbreaks across the region. The “gold standard” for testing a new drug would call for vaccinating half of a population at risk of contracting Ebola, while giving other people in the virus zone a placebo. Instead, the team working on the new vaccine used a “ring” design. When a first Ebola case occurred in a village, researchers vaccinated everyone in contact with the sick person. Such "rings" of vaccination took place either immediately after an Ebola infection was confirmed or three weeks later, according to the researchers' random assignments. Of 2,014 people vaccinated immediately, no one had contracted Ebola when tested 10 days after receiving the new drug. In the clusters where people were vaccinated three weeks later – 2,380 people – 16 people contracted the virus. Trial data will now go to regulatory agencies to obtain a license for the vaccine which will allow it to be developed in bulk for future Ebola epidemics. There have been a total of 27,748 cases of Ebola in Guinea, Liberia and Sierra Leone, with 11,279 reported deaths. The outcome of many cases is not yet known, however, and the eventual full toll like will be significantly higher. Carol Pearson contributed to this story.